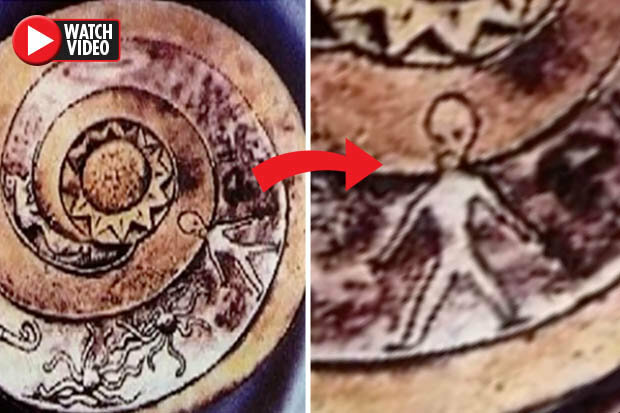 ALIENS ruled the world back in ancient civilisations and a collection of 10,000-year-old discs prove it, according to theories circulating online. Bizarre video footage shows stones discovered by archaeologist Chi Pu Tei back in 1937 when he was trying to find shelter in the Kunlun-Kette mountains of China. Team members entered the caves and discovered inscriptions on the walls. At the back of the cave, they uncovered several tombs, aligned in a row, containing strange looking skeletons, each no larger than one metre in length. Buried alongside them were more than 700 unusual discs covered in unexplainable artwork. And now, video footage has emerged attempting to explain the story. YouTube channel We Are If posted a clip claiming the discs depict the crash site of an extraterrestrial spacecraft 12,000 years ago. And the stones were apparently left 2,000 years later. The narrator goes on to explain the strange small figures found alongside them could be descendants of the Dropa. The Dropa tribe is said to have been a group of several hundred dwarfs measuring no more than four feet in height. They also claim the tunnels suggest an alien community lived underground. And this may explain the "aliens" edged into the discs.